Can Cats That Have a Urinary Tract Infection Make a Full Recovery? Cats with UTIs generally make a full recovery. If you think getting a urinary tract infection is awful, imagine not being able to tell anyone about it. 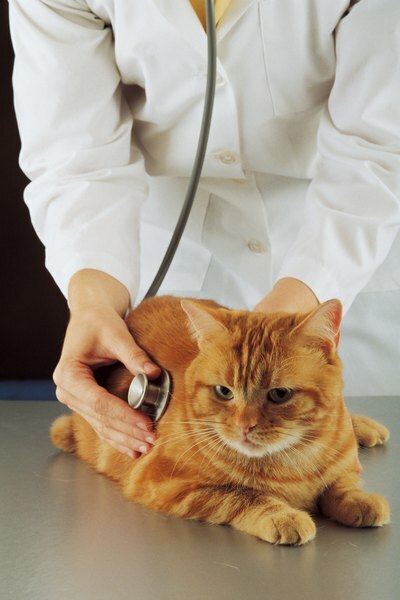 When your cat gets a UTI or a similar affliction, it's up to you to spot it and get treatment. Fortunately, when treated, cats can bounce back pretty reliably. Cats can develop urinary tract issues for different reasons, some of which are more obvious than others. For example, if your cat has a kidney stone or debris accumulation in his urethra, that can obviously cause some issues like infections. Same with the bladder -- if it gets inflamed or infected, that can affect urination. Other problems that cause urinary tract issues, though not necessarily infections, include spinal cord problems, stress and cancer. If you think your cat may have a UTI, it could be what your vet calls Feline Lower Urinary Tract Disease (FLUTD). FLUTD isn't actually a clearly defined issue like an infection, but rather a group of symptoms affecting the urinary tract. While a UTI is a cause of FLUTD, other causes include urinary tract blockages and physical deformities. Because FLUTD can be caused by one of many things, including UTIs, you should always take your cat to the vet when you suspect that he has urination problems. The symptoms of FLUTD, including UTIs, typically have to do with urination problems. For example, if your cat isn't going to the bathroom as often as usual, or seems to be straining or in pain when he does, it could indicate a UTI. Excessive licking of his urethra or self-imposed dehydration can also indicate a UTI or another FLUTD-related problem, as can a hardened abdomen -- this happens when he isn't passing urine. Your cat's recovery depends on the severity of his UTI and how quickly you seek treatment. For example, if he becomes dehydrated as a result of water avoidance, he may need to be forced fluids by a veterinarian. That aside, cats generally bounce right back after being treated for a UTI -- they typically make a full recover within a week or so. If your cat doesn't seem to be responding to treatment and still shows symptoms of FLUTD after that amount of time, he needs to go back to the vet for a reevaluation. What Is a Low Percentage of Ash in Cat Food? Can Cats Die From Bladder Infections? How Soon Can You Train a Boxer? Does Science Diet Have a Urinary Tract Formula for Cats? Do Male Cats Get Uriniary Tract Infections?